If you have purchased a sloping lot of land, it is important to design a house that is appropriate to the land. The design will need to consider your lifestyle and ways to try and minimize going up and down stairs. There are three different types of slopes. Each type will affect the design of the house. The design for sideways sloping land is generally a split level. The garage is on the lower level with a second level for living areas and a third level, above the garages for the bedrooms. The design for a downslope from front to rear, will be a single storey on the road frontage and two storey at the rear. Living areas and bedroom areas can be designed to suit the families living style. 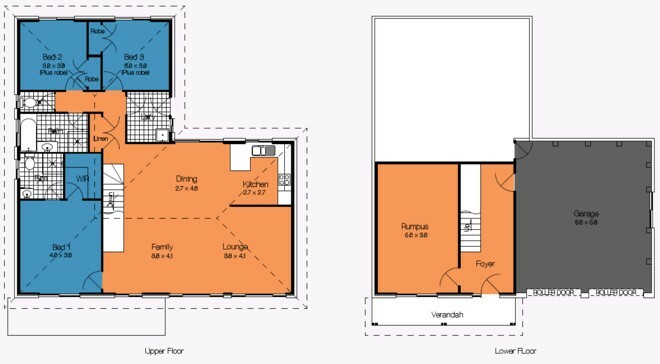 but usually the living areas will be on the upper floor. The garage will be on the upper level which is level with the street. The design for an upslope from front to rear, will be two storey on the road frontage and a single, upper storey at the rear. Living areas and bedroom areas can be designed to suit the families living style. 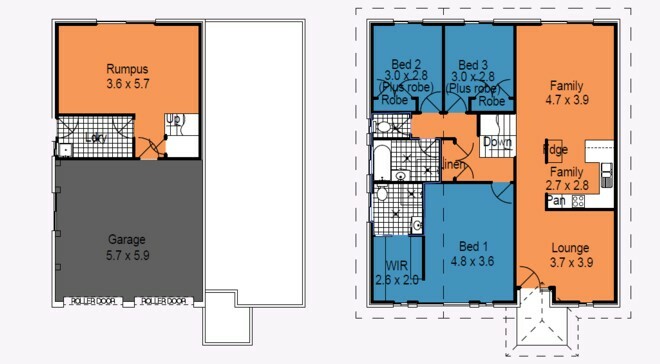 but usually the living areas and bedrooms will be on the upper floor. The garage will be on the lower level which is level with the street.